With two weeks left in the season, it's time to consider the candidates for each of the league's regular season awards. After looking at the Kia Most Improved Award, we tackle the Kia NBA Sixth Man of the Year Award. 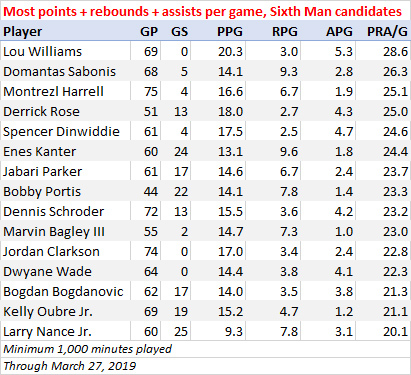 Those numbers don't include any games that those players may have started (though neither Clarkson nor Williams has started a single game and Davis has started just one). 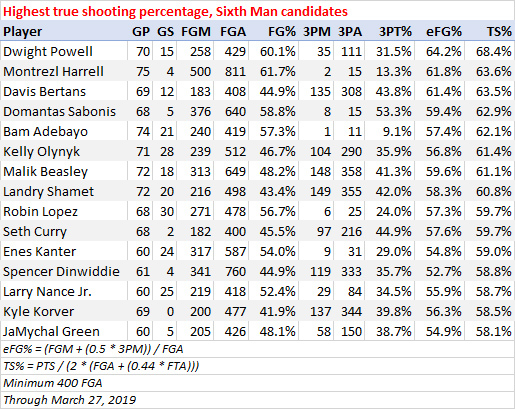 Everything below includes all games that Sixth Man candidates have played. Here are the players who have averaged the most points + rebounds + assists per game among those that have played at least 1,000 minutes and started less than half of the games they've played in. Some Sixth Man candidates (and winners) can be volume scorers. Here are the leaders in true shooting percentage (which measures scoring efficiency) among players that have taken at least 400 shots from the field and have started less than half of the games they've played in. Williams has a true shooting percentage of 55.6 percent, which is slightly below league average (55.9 percent), but better than the average true shooting percentage for guards (54.3 percent). 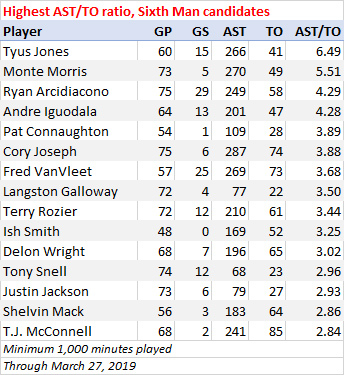 For a look at playmaking efficiency, here are the leaders in assist/turnover ratio among players that have played at least 1,000 minutes and started less than half of the games they've played in. The best reserves make an impact by helping their team outscore its opponents. 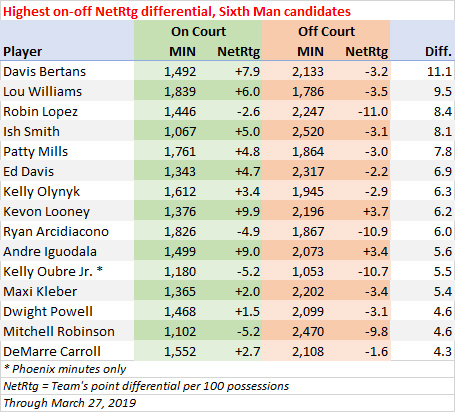 Here are the sixth man candidates (those that have played at least 1,000 minutes and started less than half of the games they've played in) with the best on-off-court differential in NetRtg (team point differential per 100 possessions). Domantas Sabonis ranks 20th here, with the Pacers having been 3.6 points per 100 possessions better with him on the floor (plus-5.7) than they've been with him off the floor (plus-2.1). Montrezl Harrell ranks 27th, with the Clippers having been 2.9 points per 100 possessions better with him on the floor (plus-3.0) than they've been with him off the floor (plus-0.1). How important a sixth man is to his team could be determined by whether or not he's on the floor down the stretch of close games. 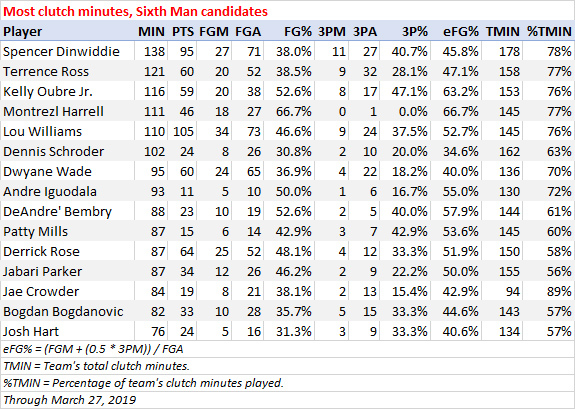 Here are the sixth man candidates who have played the most with the score within five points in the last five minutes of the fourth quarter or overtime. This is the one knock on Sabonis' resume. As important as Sabonis has been to the Pacers (and though he's shot 8-for-9 with the score within five points in the last five minutes), Nate McMillan has generally gone back to Myles Turner with the game on the line. Sometimes, it's an offense-defense platoon, but Turner (79) has played more than twice as many clutch minutes as Sabonis (38).